To start, a confession. Razzmatazz used to be my least favourite track on Intro. I even skipped it on occasion, and the feeling lingers slightly that it rates significantly lower than Babies or O.U. in the pecking order of Gift singles. It was the third to be picked, seemingly because it vaguely fitted the template of the previous two singles, but being a downer rather than an upper it just didn’t seem to have the same effect. This week I’ve been attempting to get to grips with something that other reviewers instinctively grasped after a single listen, but which I’ve been missing for the best part of twenty years. Please bear with me. The first two Gift singles had been aural representations of intense rushes of feeling, imbued with ever-rising excitement, demonstrating previously unseen scope and ambition. Razzmatazz continues this, in a way, but instead of excitement or joy the emotion represented is that particular kind of sinking feeling you get at 10.30 on a Saturday night when everyone else has gone out. 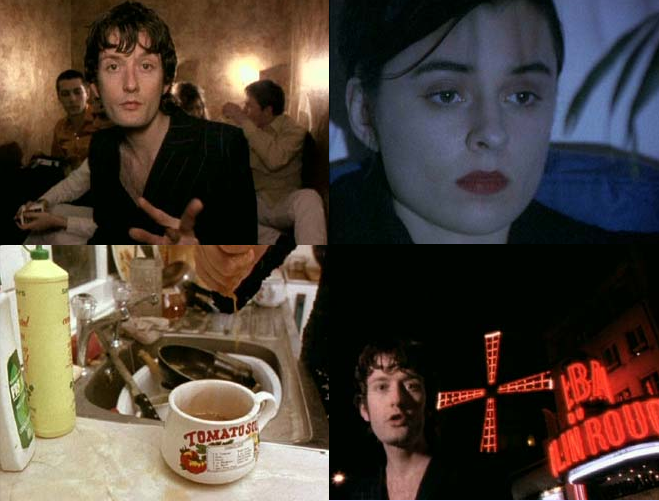 In a sense it’s another grim kitchen sink melodrama along the lines on 97 Lovers and Little Girl (With Blue Eyes), but the twist this time is that instead of this being personal or observed, it’s all laid out in the form of an accusation. This is a song for an ex, one he evidently had a bad break-up with, but instead of presenting himself as the victim he’s at once the perpetrator and a perversely ambivalent onlooker. This is what makes the lyric so novel – he’s using empathy as a weapon. I didn’t even know that such a thing was possible. It’s a line that’s hard to straddle. Being vicious and spiteful, but being so on-the-money that you’ll be forgiven for anything you say. Is there a threatening undercurrent here, a suggestion that the woman’s power lies entirely in throw-away surface details, that underneath she’s just an empty husk? Does saying these things make them true? Is this song, for all its power, ultimately an act of misogyny? In his defence I would posit that the voice in the song may not be that of Jarvis himself. It seems to be more like an internal monologue – the nagging voice of self-doubt after a bout of self-confidence is scuppered by a series of let-downs and mistakes. The part of it involving ‘the narrator’ himself are fairly minimal, his replacement – a Rowan Atkinson lookalike – has also disappeared, and she seems to be missing his company too, as much as you can miss anything you didn’t want until it was lost. The empathy has to come from somewhere, and according to Jarvis it’s because we’re down in the gutter with her. “It’s the most bitter song we’ve ever done, but however harsh I am about the people in ‘Razzmatazz’, I’m not writing from above their level. I’ve got a lot of experience of being as sad as them, if not more so.” – Jarvis in Melody Maker, 1993. In the interests of not being a man making judgement calls on feminist issues, I’ve asked FMW’s official feminism correspondent Tricia Zion for comment. Here’s what she had to say. Representing all of this musically seems like a massive task, but naturally things don’t happen that way round. The inception of the thing was yet again the purchase of new instruments – in this case Jarvis buying a 1980 Korg Trident synthesiser for Candida, the sound of which laid the foundations of the song. Razzmatazz was only given a handful of live performances before it was taken on the first part of a tour of London studios. First it was recorded with Ed Buller at Maison Rouge, then taken to Matrix for a remix a few days later. That version was soon deemed to be “not beefy enough” and a couple of months later the group took it to a studio in Hoxton to have the drums re-recorded, this time using Phil Vinall instead of Buller, and finally they went back over to Matrix for Vinall to do a final remix. All this work was definitely worth it – the single version exudes quality, every little touch, every sound being perfectly in place from the low, troubling bed of the Korg synth to the all-in-it-together whole-band swoop of the chorus. It’s a masterpiece of simplicity, every sound perfectly in place, and perhaps the only thing to say on the negative side is that this doesn’t entirely match the lyrical content. The heart-sinking is there, but not really the despair, which would, after all, have been incongruous in an indie-pop song. This is maybe why I found it hard to love; all those little things, they weren’t working for me. My doubts do not stretch to the video, however. Recorded on-the-fly in two separate countries, it’s worth another lengthy quote by itself. The finished video is a magnificent collage of stolen moments, mess and squalor – all risen above through sheer willpower – with home-made glamour and an eye for detail. The editing is nothing short of superb, better even than either of the videos for Babies. Released with ‘Inside Susan “A story in three songs”‘ on the b-side, it’s another step up for the group, their first charting single (#80, for one week), and generally a successful maintenance of forward momentum. I would actually pick out ‘Razmatazz’ as a personal choice for best Pulp single. Not quite the first song to alert me to the darker aspects of their work but it’s certainly strong stuff. If the girls lovelife is in tatters then her family situation sounds worse than the average EastEnders regular. It’s good to see some focus on the videos in this blog. Pulp are up there with New Order and PSB in terms of music video art at its best. We all have different opinions, of course. On Youtube, someone suggests that ‘Death Comes to Town’ should have been on ‘Separations’ in place of ‘Death II’. And ‘Death II’ is my favourite song on the album. I peronally feel that ‘Razzmatazz’ is far better than O.U. But then I’m a sucker for dark lyrics set to a pretty tune. My only complaint is that the sound quality does not seem too good to my ears.